Netflix is an entertainment god. What started as a DVD rental service morphed into the most important video streaming service on the planet. But like any all-powerful god, Netflix can be tricky to deal with sometimes. I hope you get a lot out of the FAQ! When you become a Netflix expert, download this .PDF that has hundreds of Netflix secret codes. No, not codes to get you free Netflix. These are codes for sub-genres of sub-genres, to save you time searching for something to watch. Plus, I share tips for getting better picture quality and how to manage “My List.” Download my Netflix guide here. Be sure to bookmark this page, in case you need help in the future. Netflix movies aren’t as plentiful as, say, their episodic series. But they’re getting into the feature film game with some big stars, like Will Smith in Bright. Which Netflix movies are worth your time? Will they win the Oscar? Which Netflix movies should I watch? That’s an extremely difficult question to answer. It depends on several variables. 1) What’s available on Netflix? 2) What kind of movies do you like? 3) Do you like certain actors or actresses, no matter what they’re in? Etc. Your best bet is to browse “What’s Trending” in the Netflix movies section. Then you’ll see the most-viewed movies. You can drill down by choosing a specific genre. You can also see how many stars other viewers gave a movie. Also, check out our long blog post on How to Find the Best Movies of the Year, Every Year. We took a deep dive into IMDb (Internet Movie Database) to come up with some foolproof methods. Can Netflix movies win Oscars? Yes. In fact, in 2018, Mudbound was nominated for eight Academy Awards, which is a record for a streaming service. Although, as of 2018, there is a movement to keep Netflix movies from being nominated. Which Netflix has Harry Potter? It depends on what country you live in. In the U.S., Netflix doesn’t have any of the Harry Potter movies. According to the website What’s On Netflix, they’re selling too well on demand and on networks. However, HBO recently offered every Harry Potter movie on demand. Are netflix shows downloadable? Are netflix downloads available offline? Yes, Virginia, you can download select TV shows and movies from Netflix to watch offline later. The operative word is select, which means not every TV show and movie can be downloaded from Netflix. You can tell that a TV show or movie is available to download from Netflix because it will have a download icon (arrow pointing down to a straight line) next to the title. It’s best to be connected to WiFi when you download Netflix TV shows or movies. Although downloading uses up about the same amount of data as streaming, that’s still a lot of data getting eaten. You should also have the latest version of the app, if you’re using a mobile device. Can Netflix download in the background? Yes, but running more than one app that requires data or WiFi connection will slow everything down. Where does Netflix save downloads? On Android? On a PC? On a Mac? Android: You can store Netflix downloads on an installed SD card. Select “App Settings” from the Netflix app menu. Under the “Downloads” heading, select “Download Location.” Then choose where you want your Netflix downloads to go. PC: Install the Windows Netflix app on your PC. After your TV show or movie is downloaded, look for it in the “My Downloads” section of the Netflix app. You can also download this information in a chart. No matter what operating system you’re using, make sure to watch it before it expires! Is Netflix on Nintendo Switch? Xbox? Sony Playstation? Nintendo Switch: As of January 16, 2018, no. Netflix is exploring possibilities for the Nintendo Switch. Xbox (Any): Yes, after you sign up for Xbox Live. Sony Playstation: Yes, on 3, 4, 4 Pro and Vita. If you have a fairly recent device, you should see “My List” at the top of the screen or in the menu. You can also visit the My List section of Netflix’s website. (Be sure to sign in to see your picks.) If you have an iOS device, and you just signed up for Netflix, it may take a while to see your list. It depends on how many devices will be used on your Netflix plan. The basic plan lets you stream and download to only one (1) device. The standard plan lets you stream and download on two (2) devices at the same time. The premium plan lets you stream and download on four (4) devices at the same time. You also have to consider your budget. See current Netflix plans and pricing to decide which plan is best for you. Can I give Netflix as a gift? How do I cancel Netflix? What is their cancellation policy? To cancel your Netflix account, go to your “Account” page within the app and choose “Cancel Membership.” You’ll be able to watch Netflix until your current billing period is over. Check your “Billing Details” to see when your billing period ends. You can re-start your account any time by visiting your “Acount” page. If you are being billed by iTunes or billed by Google Play, Netflix has other instructions. Whose Netflix account can I use? You can have up to five profiles on a Netflix account. So, five people in your household can have their own profiles on one account. Get that? IN YOUR HOUSEHOLD. Netflix cannot connect. Netflix cannot play title. When Netflix isn’t working. When Netflix keeps buffering. According to Netflix’s support center, the number one reason any of these things happen is a slow or intermittent internet connection. No matter what you’re watching Netflix on, the first thing to try is shutting it off and turning it back on (like your computer, your game console, your iPad). The next thing to try is connecting the device directly to your modem, in case the WiFi is the problem. You could also try restoring your ISP’s default settings. After that, things get really specific. Check out Netflix’s troubleshooting section for more help. Where is the nearest Netflix shipping facility? Also, why are you still watching DVDs? Where Netflix and chill come from? In 2009, when Netflix was just picking up steam, “Netflix and chill” was an innocent phrase. Like, “Work was rough today. I just want to sit on my couch, put on Netflix and chill.” In 2014, the phrase became code for booty calls thanks to memes that men started sending out, with smirks and “when she wants to Netflix and chill.” In 2015, the Urban Dictionary added the phrase to its definitions. When Netflix jumped into the streaming business, there were some setbacks. The company found it much harder to negotiate good prices with studios and production companies. What did they do? Started making their own quality entertainment. Having great and exclusive Netflix content made them the behemoth they are today. How did Netflix get started? When was it created? Reed Hastings and Marc Randolph co-founded Netflix in 1997. A year later, they had an online presence. In 2000, they offered a personal recommendation algorithm to help people find movies. Streaming video was introduced in 2007. In 2013, Netflix became the first streaming service to win an Emmy award. They won three for House of Cards. Netflix vs. Amazon Prime or Hulu? With so many streaming choices, you can get overwhelmed with deciding where to spend your money. Let’s break down the differences between the biggest streaming services. Pros: Fantastic original programming across multiple genres. Finding and acquiring new content that isn’t well-known but turns out to be excellent. Cons: The more they compete with Hollywood studios, the more Hollywood studios won’t sell them their prime movies and TV shows, so they might not be available to you. In fact, in 2018, there’s a movement to ban Netflix movies from earning an Academy Award. Pros: You get not only access to their Prime Video choices, but also free shipping, Prime Music and other perks. They’re beginning to develop winning shows, like The Big Sick and The Marvelous Mrs. Maisel. Can add cable channels, like Starz and HBO. Cons: If you want to watch a hit TV series or a hot movie, you’ll have to wait until its run its course on other services, which means a long time. Pros: Watch broadcast TV shows the day after they air. That’s HUGE. They used to offer them, like, a week later. Plus, Hulu has an enormous catalog of classic TV shows you won’t find easily on other services. And they’re taking a cue from Netflix and developing solid original programming, like The Handmaid’s Tale. Can add cable channels, like Starz and HBO. Cons: Getting rid of ads is extra, on top of what you already pay. If you have any kind of on demand, like Xfinity, it’s duplicate stuff. There are other services too, like HBO Now, CBS All Access and YouTube’s paid service. I didn’t cover these because they aren’t as comprehensive or as popular. Questions? Tweet me @realmediamedusa or email me at [email protected]. 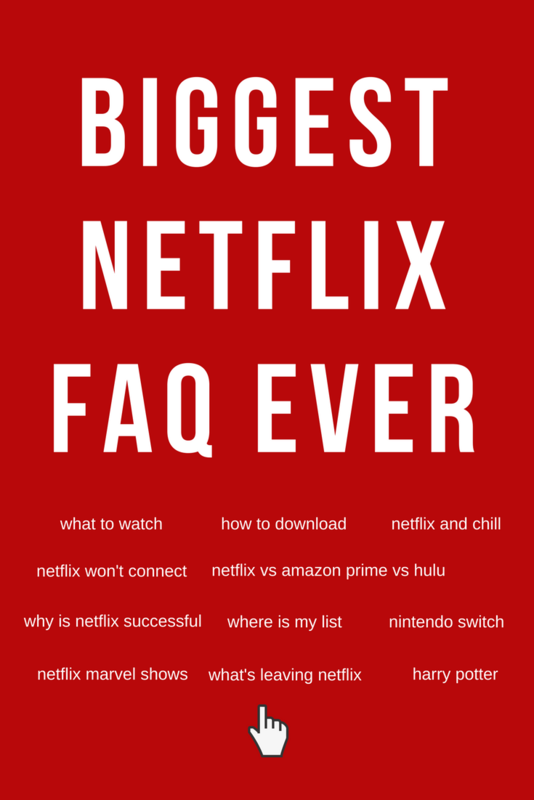 I’ll be happy to add it to this Netflix FAQ. As the service evolves over time, I’m sure we’ll find other questions to answer.